Our all Japanese Futon is manufactured by Maruhachi-Mawata co.ltd. Under Futon (Siki-Futon) is made of Down and Feather fabric mixed with cotton 4 layer construction. This time we send all the Futon to the cleaning factory of Maruhachi-Mawata in Hamamatsu. They pick up and deliver the Futon conveniently. So we have clean and comfortable one from them. 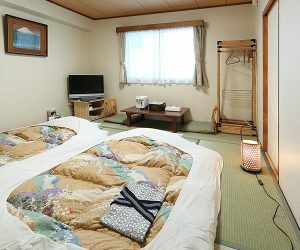 Please try to stay at home in Japanese style room with us.